The Samsung Galaxy A7 2018 edition smartphone launched today on September 25 at New Delhi in India. The main highlight of this smartphone is the triple rear camera set up and side-mounted fingerprint sensor over the power button. The device display is having an 18.5:9 aspect ratio and the glass back design. The first impression by holding the device feels premium and very lightweight than other devices. We can also say that Samsung is the first company to bring a triple rear camera smartphone at an affordable price in India. This handset is the successor of the Samsung Galaxy A7 (2017) edition of last year. The handset will be available via Flipkart and Samsung India online store. There isn’t any confirmation for the offline availability. However, we can expect as this one is the first ever cheapest triple camera device by Samsung, it could be launched with a different model name for an offline market as well. The Samsung Galaxy A7 2018 smartphone has been priced at Rs.23,990 for the 4GB RAM + 64GB internal storage variant. Whereas, the 6GB RAM + 128GB storage model priced at Rs.28,990. It will be available from September 27 and 28 in Gold Millenial, Premium Black, and Striking Blue color options. 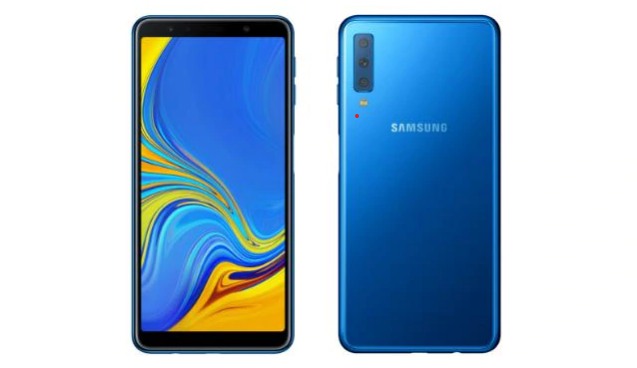 The Samsung Galaxy A7 2018 smartphone comes with a 6-inch full HD+ Super AMOLED infinity display with a resolution of 1080×2220 pixels and an 18.5:9 aspect ratio. The screen features the Corning Gorilla Glass 3 protection. The device is powered by the Samsung Exynos 7885 SoC which is an octa-core CPU clocked at 2GHz. The device comes in two variants such as 4GB/64GB and 6GB/128GB model. The storage can be expandable up to 512GB via a dedicated MicroSD card slot. The Galaxy A7 2018 device features a triple rear camera set up of a 24MP primary sensor with f/1.7 aperture and PDAF, a 5MP depth sensor with f/2.2 aperture and an 8MP ultra wide sensor with f/2.4 aperture lens with a LED flash. On the other side, the front features a single 24MP fixed focus selfie camera with f/2.0 aperture lens and a selfie flash. It also features the selfie focus and pro lighting mode as well. The device runs on Android 8.0 Oreo with Samsung Experience 9.0 out of the box. It does have a dual nano-SIM slot and a dedicated MicroSD card slot. 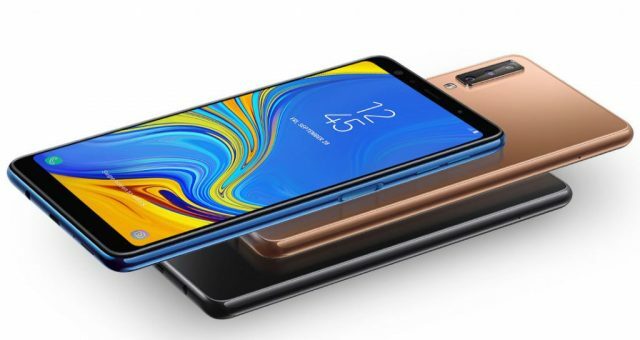 The handset includes connectivity options like 4G VoLTE, Wi-Fi 802.11ac, Dual-band Wi-Fi (2.4GHz+5GHz), Bluetooth V5.0, ANT+, Micro USB port, NFC with Samsung Pay support, GPS, GLONASS, Beidou, and a 3.5mm audio jack. It does have all the necessary sensors like Accelerometer, Gyroscope, Proximity, RGB Light Sensor, and a side-mounted fingerprint sensor. The handset is packed with a 3,300mAh battery without any fast charger. The smartphone measures 159.8×76.8×7.5mm and weigh 168 grams. The pricing is slightly higher than expected. However, most of the Samsung devices are costly than other devices.